Q. I have ordered an item with free shipping why am I being charged with delivery? 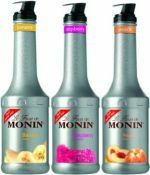 A. please make sure you are looking on monin UK website, not all flavours listed on the monin website are available in the UK. Q. Do you ship to N.Ireland? A. We can, this is a chargeable service, please call for a quote. Q. Are the syrups kosher? Q. How long do the syrups last? A. When produced they have between 1-3 year life span, we will try to send out syrups that have at least a 6 month life span left. Q. Who is your courier?